This year, the Novena of Grace at Gardiner Street saw the introduction of what we hope will become an annual event for young people across Dublin, ‘Hearts On Fire’. The faith festival, run in conjunction with the 11 o’clock Mass of the Novena, was a huge success in its inception – thanks to the ready cooperation with the Parish team members. The programme team, made up of Jesuit novices, Paul Prior and John Bosco, volunteers, students, and parish staff, managed to bring in school groups from far and wide for a whole host of activities, games, workshops, music, prayer, and discussion from 9:30am-1:00pm each day. Our vision in the beginning was simple: to provide our young participants with an encounter of Christ’s love. I think that in the spirit of the Jesuit mantra of ‘Finding God in All Things,’ it would be fair to say that we achieved this – though not of our own accord, but with the Spirit guiding and leading all the way. There was a palpable sense of energy and dynamism among our youths present, and for many attendees, they had never seen a church so full, which inspired and planted seeds for their growing minds. It was both engaging and formative for students, they said, to be part of our parish movement, community prayer, and devotion to Francis Xavier – which struck them as so rare, unique, and nourishing in today’s world. Students took the time to write their own intentions to God, and actively participated where they could in programmes and Masses, bearing gifts, and engaging in song, and conversations with older members of the Congregation after liturgies. It was heart-warming for the youths to be welcomed as they were during each Mass, so warmly by Fr. Kevin O’Rourke and the crowds during services – often receiving applause for ‘just showing up’. One could see the smiles sprawling across the children’s faces at being recognised, seen, and valued for their presence, and – who would blame them! Indeed, many more moments and highlights occurred throughout ‘Hearts On Fire’, and it would be impossible to list them all here. With eyes wide open and receptive hearts, though, we might think back to the laughter and dancing witnessed in the Ignatian Chapel, or the hugs, stories, and joys shared by our young people with ‘total strangers’ in our intergenerational projects, noting how quickly the two groups became friends and companions for each another. One could ponder the sparks of insight and creativity in Sr. Éilis’ writing classes, or the joy found in the prayer workshops of Fr. Kevin. 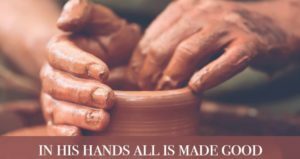 We could listen again and receive the newfound talents discovered in the theatre and song-writing sessions of John Bosco and Gerry Keegan, or remember Jesus’ vision for the Kingdom, as espoused by Peter McVerry. If our perspective was broader, we might look to the testimonies of Kris Vekic and Fergal McDonagh, who spoke so passionately about pursuing justice overseas and their concern for refugees. Perhaps we’d look at the moments of peace that came about through meditation with Fr Myles O’Reilly, and the breaking down of their prior barriers towards Church and faith through Taizé. A lot happened over the course of the festival – and the bonds, conversations, and new friendships made by transition year students with others from different schools was encouraging to see. But what of their connections to Gardiner Street and the Church, more broadly? Well, we know that we did our best to plant in them seeds of love, a sense of community and kinship, and hope for the future. Are their hearts really on fire, now, though? We’ll never know, but ours certainly are. We are so grateful to the youths, for their added flavour and spice of life in our liturgies, lighting up the hallways of the Pope Francis Corridor after Masses, and for keeping us laughing and grateful for every second spent together. There is a sense of renewal and cause for celebration among the programme team for the joy they brought to this parish, and with great memories made; we’ll look forward to building more. This project is only beginning, but we have made great progress already, and hold optimism for the years to come. For now, a break, thanksgiving, and allowing of God’s grace to enter and do the rest is what’s needed. We’ll see you again in 2020. Thanks for everything, Gardiner Street! This ‘Novena novice’ - new to the Novena, new to the Society of Jesus - had heard much about the Novena of Grace in Gardiner Street; the experience was something else! What an uplifting festival of faith and devotion! What an example of living faith handed on from generation to generation! People have been coming to this annual 9 days of prayer in Gardiner Street since 1832, for some 50, 60, 70 years plus. This is as much a social phenomenon as it is a religious one. Stories of the ‘craic’ had by the crowds overflowing from the church and the marriages made at the Novena of Graces of yesteryear evoked a different era. And, whatever it was about it, many agreed this year’s Novena ‘was back the way it was!’ There was genuine satisfaction and gratefulness in the air! Fr Kevin O’Rourke’s homilies anchored the overall experience in a powerful way; words of wisdom distilled in daily life touched many people deeply. His description of suffering - ‘Good Friday people’ - was particularly meaningful. Most inspiring was the witness of the many people who, carrying a full range of life-concerns in their hearts, came daily to pray fervently to Francis Xavier to take care of and grant their intentions. 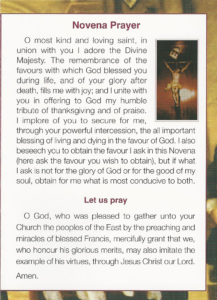 The silent pause for intercession in the Novena Prayer after the words ‘I also ask you to obtain the favour I ask in this Novena’ was a poignant and sacred moment. The ‘flame of faith’ which was lit after communion at the 7.30 pm session to inaugurate silent prayer was among the most intimate moments; one could imagine Christ’s ear being filled with whispered hopes and desires as the flame flickered on the altar of the darkened church. Faith, no matter how feeble, is light for our lives, for our communities, for our Christian family. The morning Novena provided a wonderful inter-generational contrast. ‘Senior citizens’ gathered quietly in the church preparing for Mass with ‘petit-mots’ and prayer intentions, ‘junior citizens’ were being brought down from booming ‘praise’ music and ice-breakers to meditative spaces to think about and discuss the deeper questions of life. A new initiative at the Novena 2019 was the ‘Hearts on Fire’ programme for young people. In the Ignatian corridor after Mass, the enthusiasm of youth and the wisdom of the elders was shared in true Irish fashion over cups of tea, I heard one person say, ‘you could trot a mouse on!’ A moment of hospitality but also a powerful example of hearts and minds connecting across generations and everybody feeling the better for it! S. Ignatius directs the retreatant of the Spiritual Exercises to ‘sentir y gustar,’ to savour the experience. For this ‘Novena novice’ at least, The Novena of Grace 2019 has left a lingering flavoursome after-taste, happy memories, hopefilled faith, friendly warm encounters, God-with-us, and still much to savour! 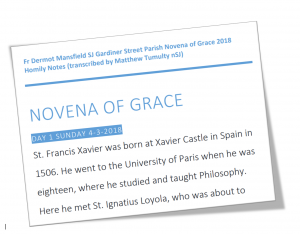 The typically Jesuit Novena of Grace, begun in 1643 by an Italian devotee of St Francis Xavier, still draws crowds in many Dublin parishes from 4th to 12th March. The Novena of Grace originated in Naples, Italy in 1643. 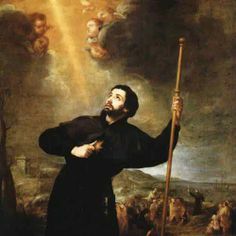 A Jesuit was cured through the intercession of St Francis Xavier, who promised that those who made the nine days of prayer in preparation for the anniversary of the canonisation of the saint would receive many graces and favours. Thus the name, Novena of Grace. It was first held in Dublin in 1712, in the church at Mary’s Lane, now in Halston St parish. Since then it has been held continuously in Dublin and began in Gardiner St church in 1832. Read below for a fuller account of this great tradition. An often-quoted memory of centre-city Dublin people is the time when the novena of Grace stopped the traffic. Crowds would come early for the devotions in honour of St Francis Xavier from March 4th – 12th each year. The overflow would block traffic on Gardiner St. The church seating about 900 would be filled, as would the small Ignatian chapel in the building, the corridors and the novena would be relayed to the old St Francis Xavier Hall. Crowds still come to the three sessions in the church, and to the novena which is now held in about twenty Dublin churches. A search on the web gives over 7700 sites mentioning it. People say things like, ‘St Francis Xavier never let me down’. They come to hear some good homilies, to take part in the prayer before the Mass, to pray for their intentions, as a sort of a Lenten retreat, to join in a community of faith for the nine days. People have been coming for forty, fifty or even sixty years, linking into the faith of their childhood and of their parents and grandparents who always made the novena. They come because they know they will like it, enjoy it and deepen their faith with like-minded people. This novena originated in Naples, Italy in 1643, when a Jesuit, Matteo Mastrilli, was cured through the intercession of St Francis Xavier, who promised that those who made the nine days of prayer in preparation for the anniversary of his canonisation would receive many graces and favours. Thus the name, Novena of Grace. It was first held in Dublin in 1712, in the church at Mary’s Lane, now in Halston St parish, and began in Gardiner St church in 1832, the year the church was built. It is simply nine days of prayer, bringing intentions to the Lord and opening ourselves to his grace. Its special focus is on the following of Jesus in the life of St Francis Xavier, listening to the word of God in the Eucharist and following responses to it in the homily. In Gardiner St there are three sessions each day. Some churches have one or two. It is a quiet, devotional novena. It is not a parish mission, and its essentials are to come to Mass and pray the novena prayer. Basic themes of the christian life are the subject of the homily each night, with reference to the life of St Francis Xavier. At each session there is the novena prayer, where we bring our intention for the novena to God. Why do that? We come in trust to God that God is interested in our life and in our needs, and in the sadness and sorrow of life. Many intentions are for loved ones – that sons and daughters may come back to practice of faith, that someone may give up drink, drugs or crime. That someone might give up an affair, or find work. People pray for jobs for themselves and for the family. For cures from depression and illness, that family conflicts may be resolved and that loved ones may find peace in life. The petitions cover most human needs and hopes. The novena brings the ordinary yet deep cares of life to God, based on the faith that God does care for our lives and is concerned for us and with what concerns us. The novena is centered on the liturgy of the Mass, is rooted in the bible in its readings and homilies on the Scriptures; it is focused on Jesus Christ whom Francis Xavier loved and served, and is a popular and communal renewal of people’s faith in people. Is it old-fashioned? Yes and no. Its tradition is long, some of the hymns are the old favorites, while others are more up to date. The language of the prayer can vary whether the more traditional prayer is used or the modern version. It is traditional in format and contemporary in the message of its inputs. Each Mass in our church ends with a short guided prayer. This prayer with the red lights on the altar at the painting of Xavier in Japan is a popular part of the evening. The novena presents no magical formula. In good gospel tradition it hears the words of Jesus, ‘ask and you shall receive’, and we ask, knowing that God always gives something through prayer. People say sometimes they have received a particular intention, and this is part of why people come. Other times they get something different - nobody goes away disappointed from God. I have given the novena now for about twenty years in many places. It is a time for me of deepening my faith in being influenced by the faith of people. It is nine days of living in the fragrance of God and the faith of others, as people give time and space to God in the cares of their lives. It is a devotional time focused on growing in love of God and Jesus for the preacher and the choirs and the ministers as well as those who attend. The traffic is no longer diverted, but lives are diverted towards God and others. The novena of grace can divert our lives to open ourselves to God’s love and to his call, as seen in the life of Xavier and in the lives of those who make the novena. In introducing us each year to Xavier, we allow his life introduce us to new and refreshing aspects of Jesus Christ, and to discover anew the challenges and love of his gospel in a new century. Come and see, come and hear and find the Lord Jesus close to you as you give time and space to him over nine days. Article by Fr Donal Neary SJ - First published in Irish Catholic, March 2003.